This is the fourth time I have rescued Simba, and three of these rescues were all in the same tree. There is only one other cat, Kitty, that I have rescued four times, so he and Simba are now tied for first place. Kitty got an earlier start but has calmed down lately. Simba busted out of the gate with two rescues in consecutive days, but his pace appears to be slowing down. Will one of these kitties break the tie, or will some other dark horse overtake them both? Time will tell. Simba is one cool cat, and I love to rescue him. He is always so calm, confident, friendly and trusting, and he is as easy to rescue as he can be. So when I got the call to rescue him this time, I was just as willing as I could be to go, but there was one problem. 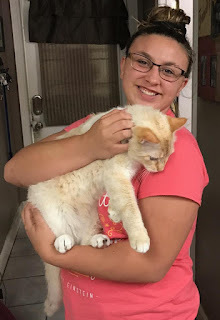 My wife and I were on the road to New Orleans to see a play in celebration of our wedding anniversary, and I did not expect to be back home in time to rescue Simba that day. I promised I would be there the following morning, weather permitting. However, on our drive home from New Orleans after the matinee play, I was thinking about Simba, and I was calculating how much daylight I would have left when we got home. I didn't want Simba to have to spend a second night in the tree, but nightfall and the unstable weather were conspiring against me. When we arrived home, I figured I would have just enough time to get Simba down if I ran out the door quickly. 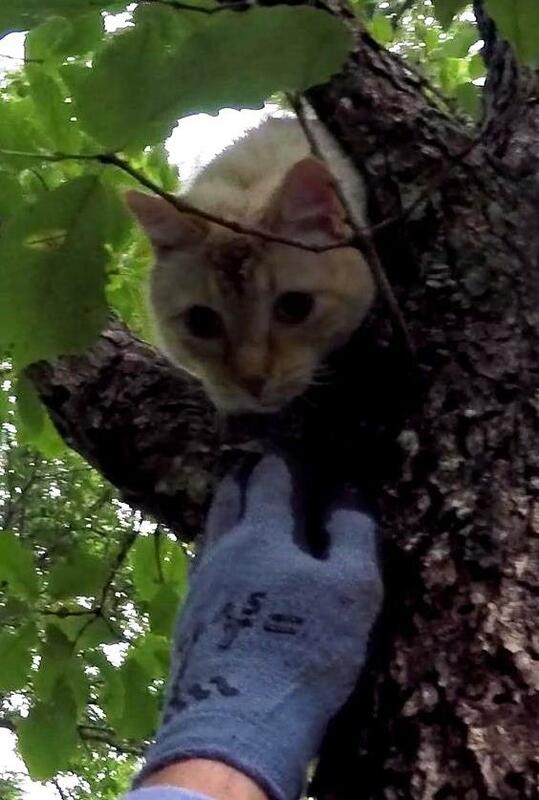 This was a case where I already knew both the tree and the cat, and I knew the rescue would not take long. And there was just enough of a break in the weather that I could pull this off, so I called ahead and took off. Simba was a little higher than usual but still only 35 feet high. He was unusually quiet, however, and I was getting concerned about him. I wondered if he might have an injury this time, and I wondered if he was going to remain as calm as before when I set my rope in the tree. Fortunately, Simba's cool nature was still intact, and he was not concerned with the commotion I created in the tree near him. I climbed up to him, and we got reacquainted. Not surprisingly, he was calm and happy to see me. After we visited a few minutes, I decided that I would try to bring him down in a carrier. On his first three rescues, he came down in my lap, but that would not be advisable this time because he was higher and we had a lot of foliage to push through on the way down. I thought he might be willing to go into the carrier even without any food enticement, so I held the empty carrier up to him. He didn't seem to know what to do with that, so I pulled it back down and opened a can of food. I gave him a bite and then put the food in the back of the carrier. When I held the carrier up to him this time, he knew just what to do. He calmly walked into the carrier, and I shut the door. I took him down and handed him to Shelly who took him inside. After I packed up, I went inside to check on Simba. He was his usual friendly self and visited with me a few minutes. Shelly had found a small wound on one of Simba's toes that had bled, We could not get a good look at it at that time, but she will be watching it. Otherwise, Simba was fine and very happy to be back in the comforts of home. Because of family allergies, Simba used to be mostly outside. After he started climbing trees, however, they have all started getting allergy shots so they can keep him inside all the time. 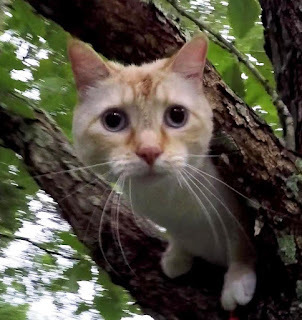 In spite of their best attempts, Simba manages to escape once in a while, and when he does, there is something about that tree that is very attractive to him. So I expect there is likely to be a fifth rescue someday. I hope so. I really like Simba, and I will be happy to rescue him as many times as is needed.